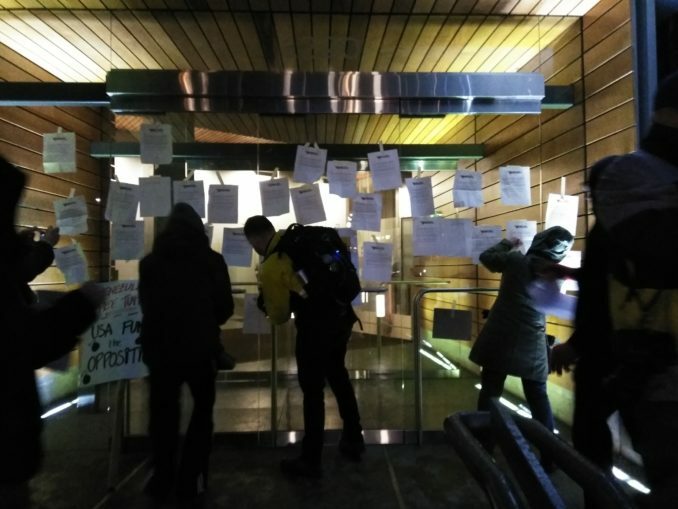 A “Hands Off Venezuela PDX” coalition marched on Feb. 8, ending by covering doors of the Federal Building with their demands. 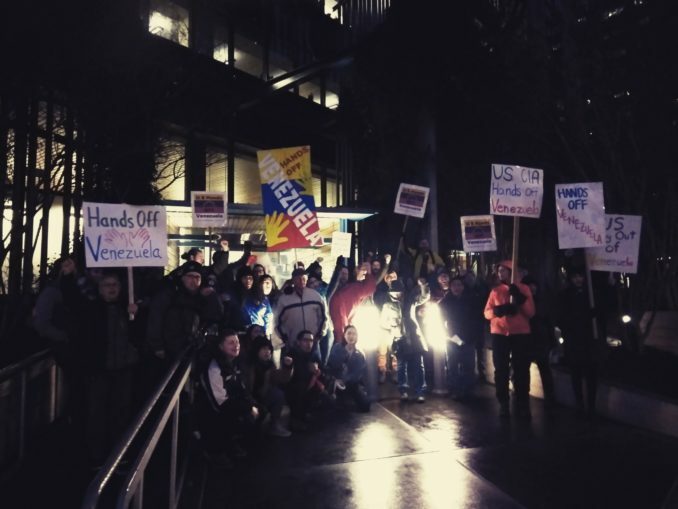 On the cold, rainy evening of Feb. 8, a new coalition, “Hands Off Venezuela PDX,” gathered in Portland’s Terry Schrunk Plaza between City Hall and the Green-Wyatt Federal Building. 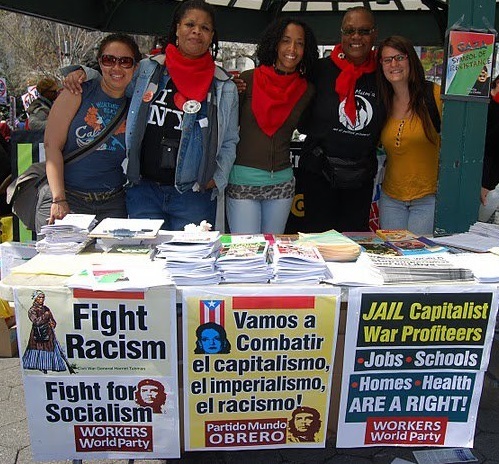 Activists came from several groups, including Veterans for Peace, the Portland Central America Solidarity Committee, Portland Jobs With Justice, Democratic Socialists of America, the International League of People’s Struggles and the Portland branch of Workers World Party. The snap coalition was formed in a week by local activists to get this initial demonstration supporting Bolivarian Venezuela into the streets. 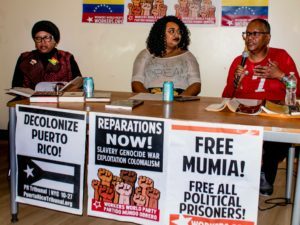 More actions are planned for the future, with regular meetings to steer the local anti-war and anti-imperialist response to the ongoing U.S. coup attempt against Venezuela. Speakers highlighted the absurdity of coup leader Juan Guaidó’s claim to the Venezuelan presidency, with Western countries’ approval of the attempted coup representing a serious violation of international noninterference and Venezuelan sovereignty. A member of Veterans for Peace made comparisons to U.S. hostilities in the 1980s when Elliot Abrams, recently appointed as Trump’s “Special Envoy for Venezuela,” was a key Reagan administration official involved in illegally funding right-wing death squads in Nicaragua. The author of this article also spoke, calling for a united anti-war coalition of all progressive movements, and emphasizing the many gains in Venezuela that stand to be wiped out if the U.S. coup is successful. 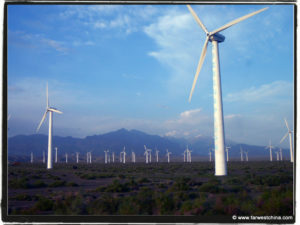 The Bolivarian government uses the money from its own natural resources to benefit its people — by building millions of units of free public housing, expanding food and medical access in poor areas, restoring Indigenous land titles, implementing reforestation efforts and sustainable agriculture, and supporting local artists and musicians in working-class communities. Several speakers raised that Venezuela sits on the world’s largest oil reserves and that U.S. officials, most notably National Security Advisor John Bolton and Sen. Marco Rubio of Florida, have been clear that control of oil is a key goal of U.S. intervention in Venezuela. But the U.S. wants the money from Venezuela’s oil to go into the pockets and portfolios of huge U.S. energy companies like Valero and Chevron, so Washington is backing a criminal coup to make that happen. After the speeches, demonstrators chanted anti-imperialist slogans and momentarily blocked traffic as they marched to the Federal Building, where they taped dozens of coalition statements to the doors. The beginnings of a Portland anti-war movement have quickly formed in response to U.S. imperialism, and are loudly declaring their opposition. 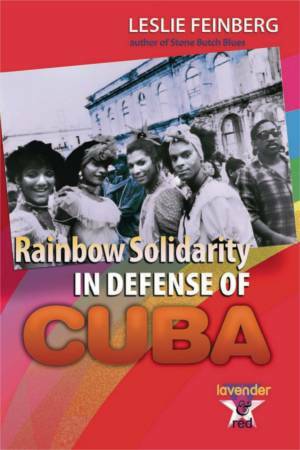 The coalition now turns to organizing a demonstration on Feb. 23, the one-month anniversary of the attempted U.S. coup. Nationwide demonstrations have been called for that day to denounce U.S. war and aggression against Venezuela, a country that represents the international struggle toward socialism.